The Iranian Cultural Society of Greater Miami Presents ‘Armenian Night’, a tribute to Armenian people, their beautiful culture, and in appreciation of their valuable contribution in enrichment of Persian culture. The evening will include live Armenian and Persian musical performances by Reza Filsoofi and Joe Zeytounian. Dr. Eftekhari will discuss notable Iranian-Armenian people and their contribution to Persian culture. Tea, snacks, and food will be provided. WHEN: Saturday, January 19, 2019 at 6:30PM. Gevorg Shahbazyan, President, FIU-AASO; Mercedes Gechidjian, President, UM-ASA; Todd Avedian, NOVA; Mishela Gevorkian, UM-ASA; Arman Shahbazyan, FIU-AASO; and Guadalupe Gechidjian, UM-ASA. Photograph credit Ashot Mamyan. Hollywood, FL— On Sunday, September 20, several representatives of the Armenian Student Association (ASA) of the University of Miami (UM), the Armenian American Student Organization (AASO) of Florida International University (FIU), and NOVA Southeastern University, had the opportunity to meet at the Armenian Independence Day picnic hosted by St. Mary Armenian Church. Following Church service, and after indulging in delicious kebabs and barbecued meats prepared by the St. Mary Men’s Club, the UM-ASA and FIU-AASO members met and discussed future plans, potential for joint events, and aspirations for their clubs this academic year and beyond. Ms. Mercedes Gechidjian, President of the UM-ASA, and Florida Armenians Broward County Chair Gevorg Shahbazyan, also President of FIU-AASO, discussed the idea of cooperation between the two clubs to bring awareness of Armenian life and culture in Miami. However, it was not just a business meeting for the members of the Armenian clubs. Social events such as joint dinners, beach days, and movie nights were also explored. “I think that by strengthening our friendship and planning ‘non-business’ hang outs with FIU-AASO we will be able to work as a family,” said Mishela Gevorkian, a graduate student at the University of Miami and member of the UM-ASA. 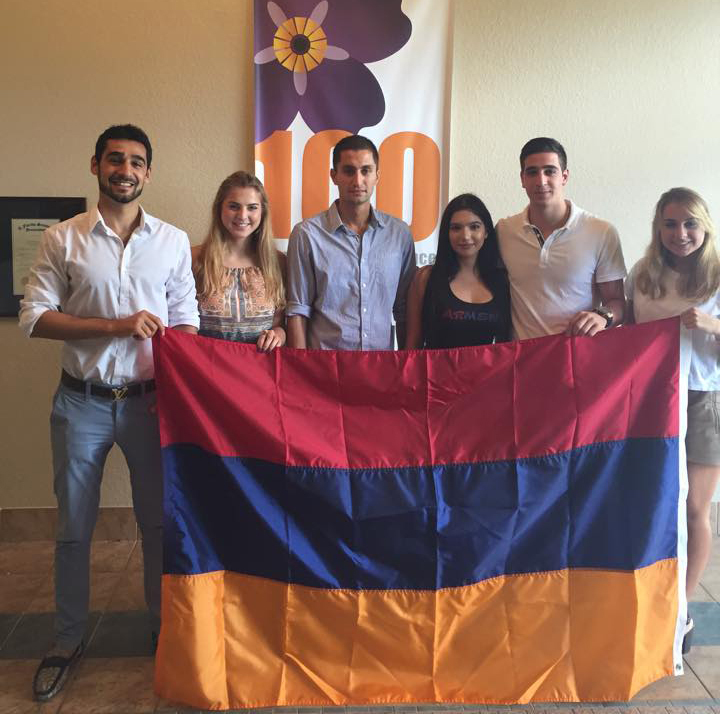 Arman Shahbazyan, an active member of FIU-AASO, was extremely happy to meet more young Armenians in South Florida. “Living in Miami, it’s a little hard given the size of our community here. So when you have the opportunity to meet new Armenians, you just become happy. We had a very productive day and I’m looking forward to future joint activities,” said Shahbazyan. Both clubs are relatively new but, since their establishment, have caught the attention of their respective student bodies and Armenian communities around the world. It is wonderful to see the next generation of Florida Armenians promoting our culture, our traditions, and our language amid their peers, as they help grow and expand the Armenian American community in South Florida. On Saturday, March 14, the Armenian Assembly of America (Assembly) hosted an Armenian Genocide symposium entitled “A Century of Genocide: The 1915 Armenian Genocide and Its Lasting Impact,” during the Assembly’s Annual Members Weekend in South Florida. Over 80 Assembly members, friends, and guests attended the educational presentations and lively question and answer session. The symposium featured Dr. Rouben Adalian, Director of the Armenian National Institute (ANI) in Washington, DC, Dr. Rosanna Gatens, Director of the Center for Holocaust and Human Rights Education (CHHRE) at Florida Atlantic University (FAU) in Boca Raton, Florida, and Hannibal Travis, Professor of Law at Florida International University (FIU) College of Law in Miami, Florida. The panel was moderated by Assembly Trustee and South Florida community leader Marta Batmasian. Armenian Assembly of America Board of Trustees President Carolyn Mugar provided welcoming remarks and introduced Marta Batmasian. Batmasian introduced the panel to the audience and recognized members of the audience who have been researching and teaching about the Armenian Genocide in South Florida. Batmasian introduced Dr. Adalian who presented the topic of “The Armenian Genocide as a Prototype of 20th Century Mass Killings,” detailing the primitive yet effective template of mass killing that was developed by the Ottoman Turkish government. He showed images from the digital exhibit “The First Deportation: The German Railway, the American Hospital, and the Armenian Genocide,” which took the audience back in time to a pivotal location of the deportations. Adalian brought to life the experiences and activities of Dr. Wilfred D. Post who administered the American hospital in Konya, a major station along the Berlin-Baghdad rail line which became the site of a large deportation camp. In defiance of the Ottoman ban on photography of deportees, Dr. Post captured what may have been some of the earliest pictures of deported Armenians. Next, Batmasian introduced Dr. Gatens who discussed “The Impact of the Armenian Genocide on Holocaust Education.” She discussed how the CHHRE at FAU had been working for years to advance Armenian Genocide education on campus and throughout Palm Beach County. Gatens drew parallels between the Jewish and Armenian experiences and highlighted challenges faced in educating the general public about the crime of genocide. Professor Hannibal Travis gave the final presentation on “The Armenian Genocide as a Political Act and International Crime.” He discussed the illegality of the crime of genocide under international law, including cases where the charge of genocide was applied retroactively. Travis gave an in depth account of crimes against humanity that have been heard in international courts and discussed avenues for Armenian efforts in this context. Following the presentations, Batmasian opened the floor for questions. Several were asked of the panel leading to a lively and wide-ranging discussion. Armenian Assembly of America Executive Director Bryan Ardouny gave closing remarks and announced the launch of an online petition calling on President Barack Obama to affirm the Armenian Genocide in his upcoming statement commemorating the 100th anniversary. After the symposium, guests were invited up to view a brand new exhibit entitled “Iconic Images of the Armenian Genocide,” that was on full display during and after the discussion. “We were pleased to bring this expert panel together for the South Florida community,” stated Bryan Ardouny. “The Assembly is grateful to Dr. Adalian, Dr. Gatens, Professor Travis, and Mrs. Batmasian for their insight and compelling presentations,” Ardouny said. Additional photographs from the Assembly’s Armenian Genocide Symposium in South Florida are available on the Assembly’s Facebook page here. Photo Caption 1: (L-R) Dr. Rouben Adalian, Marta Batmasian, Hannibal Travis, Dr. Rosanna Gatens. Photo Caption 2: Program speakers at the Assembly’s Armenian Genocide Symposium in South Florida.